On the occasion of the 73rd General Assembly, the UN is hosting a plethora of events with some of the world's most prominent leaders and experts, to set the pace on dozens of critical global topics. To help you navigate and make sure you don't miss out on anything important, here's the second of our daily UN News guides to what's going on. On this first day of the General Debate, 36 Heads of State and Government are scheduled to address the General Assembly on Tuesday, including the Presidents of Brazil, the United States, Ecuador, Turkey, France and Nigeria, the King of Jordan, the Supreme Leader of Iran and the United Kingdom's Prime Minister. The theme this year is Making the United Nations relevant to all people: global leadership and shared responsibilities for peaceful, equitable and sustainable societies. The General Debate runs every day except for Sunday, from 9 am to 9 pm roughly, until 1 October, and you can watch it all live on UN Web TV. In March, UN Secretary-General António Guterres launched "Action for Peacekeeping"- or "A4P" as we call it here in the hallways of the UN. The initiative calls for key stakeholders to renew their collective engagement through the Declaration of Shared Commitments on UN Peacekeeping Operations. On Tuesday, over 100 Member States will attend a high-level event, chaired by the UN chief, to discuss the strengths and weaknesses of peacekeeping operations and define the best way forward, to achieve excellence. It will start run from 3 pm to 7 pm, can be watched live here, and followed on Twitter using #A4P. Did you know that 500 billion plastics bags are used each year? That 1 million plastic bottles are purchased every minute? Learn about the different ways in which governments are Fighting Plastic Pollution at 4pm thanks to the live broadcast of the event on UN Web TV. 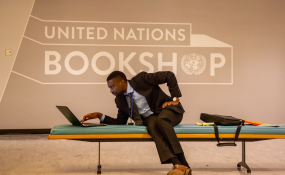 As you use your laptop or smartphone to read this guide, join via webcast the UN at 11:30 am in its quest to determine whether the "digital revolution" is the curse or the cure in our attempt to leave no one behind. Follow and participate in the global discussion with #Tech2030. The SDG Media Zone (#SDGLive) continues with, among other world-class speakers, Nobel Peace Prize Laureates Leymah Gbowee and Kailash Satyarth kicking off the festivities of the day at 10 am. You can watch everything as it happens but, for future reference, all videos from "The Zone" are later posted here. At 4 pm, watch live French President Emmanuel Macron, Canadian Prime Minister Justin Trudeau, and UK Prime Minister Theresa May for "12 years to break barriers and leave no girl behind: Countdown to 2030." At the same time, a high-level event will examine issues of poverty and the right to legal representation surrounding the death penalty. And, at 4:30 pm, the spotlight is on Violence against LGBTI individuals, with a special focus on extrajudicial, summary or arbitrary executions. Newly appointed UN High Commissioner for Human Rights, Michelle Bachelet, will be among the distinguished panel members. Close to six years of conflict means South Sudan is facing devastating levels of humanitarian need. The event will bring the voices of conflict-affected South-Sudanese women, children and men to UN headquarters, and examine the challenges and successes of the international response, with a call for continued support. It will run from 11 am to 12:30 pm and will be livestreamed. If you happen to be in New York and able to visit UN Headquarters, don't miss the exhibit marking the 25th anniversary of the rapid response mechanism UNDAC (... basically they are the relief A-team which deploys within 24 hours after natural disasters strike, to ensure that relief reaches those affected as soon as possible). The installation is located in the North Lawn of UN compound. And if you're not in New York, this should almost do the trick.